Positive Coaching Alliance urges you to consider two different types of goals: effort goals and outcome goals. 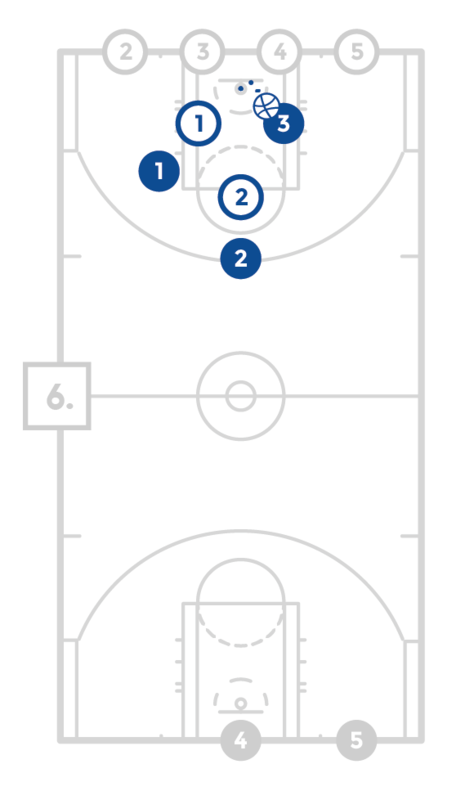 As an example, an outcome goal is grabbing a certain number of rebounds in a game, and an associated effort goal is that defenders establish excellent box-out position on each opponent’s shot. This works because players cannot control results (in this case, height and leaping ability relative to the opponent play a role), but players can always control their effort. Having players focus on an effort goal gets them into the habit of exerting that effort, which often is the key to improved outcomes. Have the players partner up with a ball and face each other. 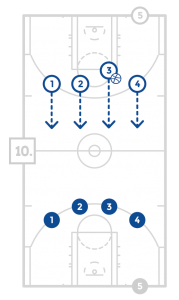 The players will work on their open step back by dribbling with the right hand, waiting until the ball is about to come back down out of their hand to push to the side/back off their left foot to the right while picking up the ball. They will then pass the ball to their partner who will do the same. Repeat this until it’s time to do the same move in the other direction. Start with two lines on the wing and 2 balls in each line (utilize other baskets if needed). Have the players take 2 to 3 slide dribbles toward the baseline with their chest facing the basket. 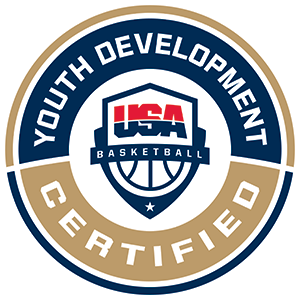 After the last slide dribble have the players take an open step back or side step and take a jump shot inside the 3 point line. The players will get their own rebound and pass to the next person in line. 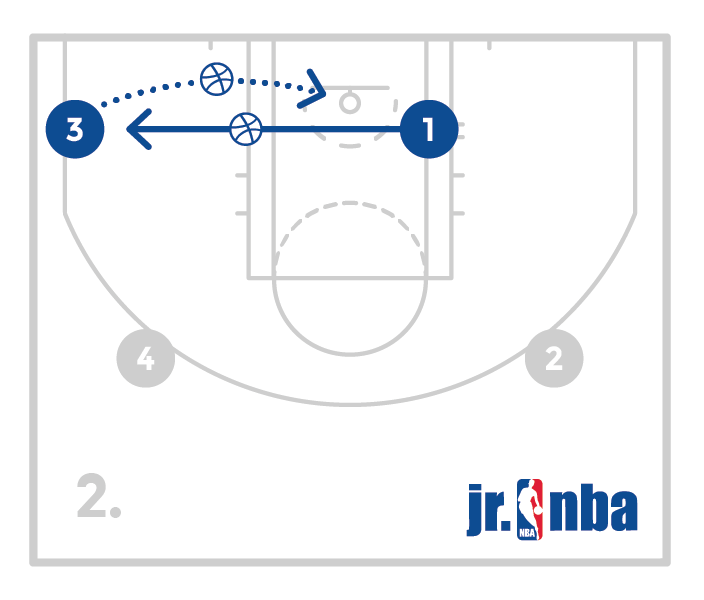 Compete with the other line for the allotted number of baskets and then switch and compete on the other side. Have the players start with a ball in a line on the wing. 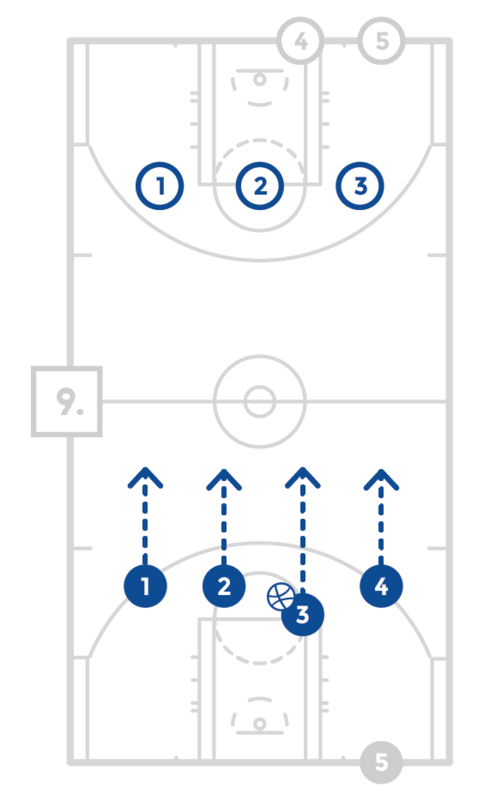 The players will make a dribble move and attack the basket for a layup. The coach should use a pad or find a way to foul the players as they go in to finish the basket. The players will get their rebound and go to the end of the line until the allotted number of attempts. Utilize more baskets or lines if possible. Work on attacking the basket and finishing through contact by jumping off two foot to maintain balance and strength. 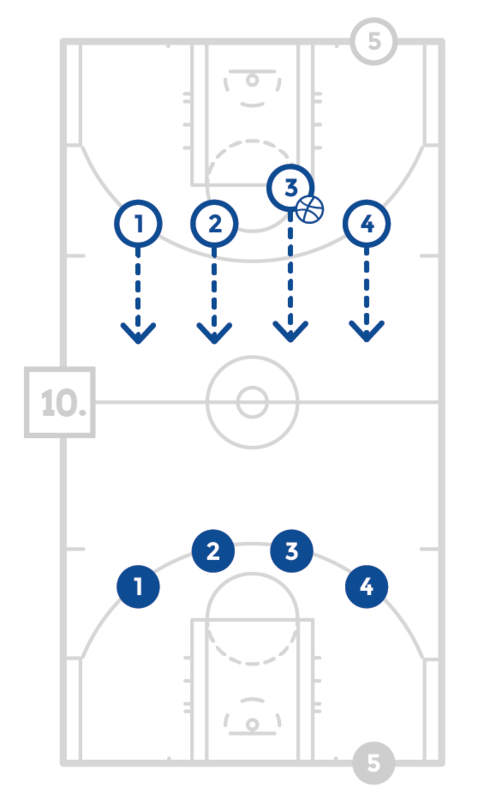 Divide the players into 2 teams and put one on each end of the court. One team will be the advantage team and start with the ball going 2 on 1 towards the other team. After a shot or turnover the 1 defender will have a teammate join and go back the other way 2 on 2. 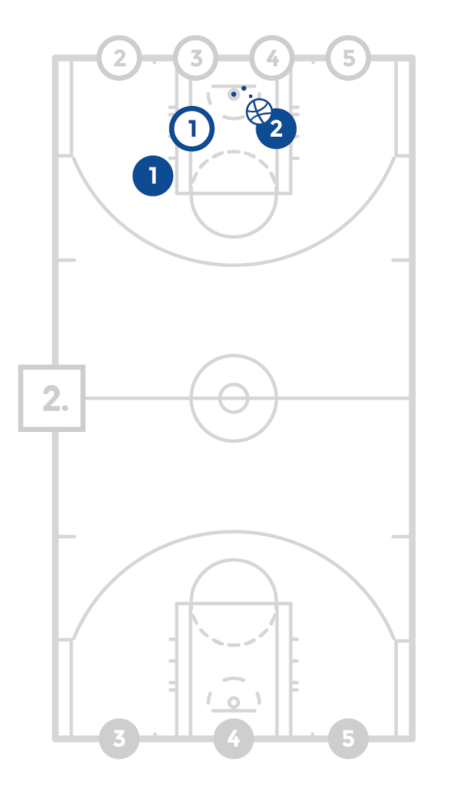 After a shot or turnover, a player will add to the advantage team as the go back 3 on 2. This process will continue, come back 3 on 3, down 4 on 3, back 4 on 4, down 5 on 4, back 5 on 5. After the 5 on 5 possession, the teams will switch so there is a new advantage team and start over. The first team to the allotted number of points will win. 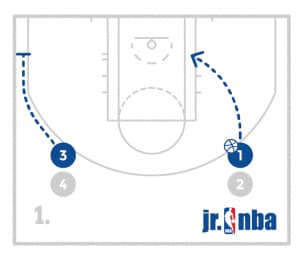 Have the guards partner up based on ability and start two lines, 1 high on each wing near half court. Have the bigs partner up and get in two lines on the baseline where the lane line meets. 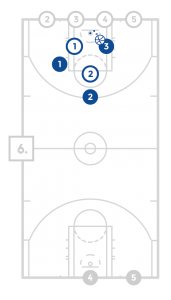 The first two guards on one wing will step on as offense and defense and the post players on the same side will do the same. 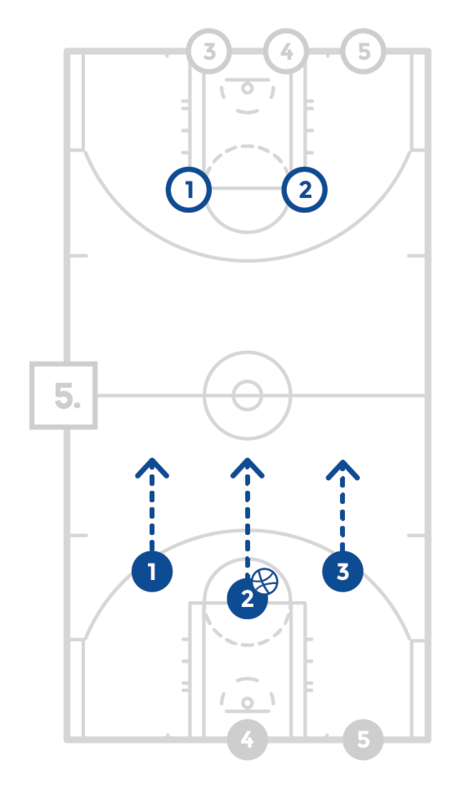 The post player will wait for the guard to signal and then go set a ball screen and the 4 players will play 1 possession of 2 on 2 from the side ball screen. Immediately after, the players on the other side of the court will do the same thing. Players should rotate sides and offense and defense with the partners and continue this drill. Coaches can put any restrictions in the drill and can dictate how to defend the pick and roll if they choose. Divide the players into teams and play full court games to 3 made baskets. No dribbles may be taken by either team.